From the reimagined series the Cylon Base Star has been added today! It's a very original building approach using the new modified plates with angular extension and flexible tip. The angles are stable and fixed by swivel hinge plates. Go and have a look at it! Probably only an error during the generation of the film scenes, several times a Golden Cylon Raider can be seen within formation of normal Cylon Raiders. Nonetheless this is reaon enough to create a separate model of the Cylon Raider. Go and have a look at it! Today the electronics and science ship Celestra has been updated. The ship appears in both, the classic and reimagined series. Go and have a look! 05.04.2009: New MINI model from the reimagined series! Besides the famous Viper starfighters, the Colonial Military of the reimagined series also use the so-called Raptor support ships. Have a look at them! 07.03.2009: 2 New MINI models from the reimagined series! Today's update includes two brand new MINI models from the reimagined (RDM) Battlestar Galactica TV series. First, the Colonial civilian starship Colonial One, and second the sleek looking new Cylon Raider. Have a look! 14.12.2008: 2 new MINI Models! Two new vessels from the Rag Tag Fleet have been added! First, the so-called Foundry Ship, a construction and repair vessel, and second an unnamed freighter appearing frequently. The Agro Ships are part of the Colonial Rag Tag Fleet, and appears in the classic BSG TV series. The design, however, was borrowed from the earlier SciFi movie "Silent Running" where it resembles the "Valley Forge". Appearing in several episodes of the classic BSG TV series, the Rising Star is another ship of the Colonial Rag Tag Fleet. Another familiar ship from the Colonial Rag Tag Fleet is the Prison Barge, appearing often throughout the series. It comples complete with accurate bridge dish and Viper launch bays! 21.04.2007: 3 New MINI Models! Today I present you 3 new models from the Colonial Rag Tag Fleet, the collection of civilian ships following and being protected by the Battlestar Galactica. Listed below are 3 transport ships of this fleet. All 3 models feature heavy use of TECHNIC® pieces, the only pieces allowing their tricky constructions. They're another example of how important it is to spread interest and skills in other techniques besides general building and SNOT. Be sure to check them out! 14.03.2007: New 2003 Battlestar Galactica! A MINI model of the Battlestar Galactica from the 2003 TV series has just been uploaded! It's very detailed and has more than 100 pieces! Of course complete with instructions. Be sure to check it out! 10.03.2007: 3 New Cylon MINI Models! There have been 3 MINI model updates today! And all 3 models are Cylon ships, counterparts for the Colonial forces. Listed below are the new models, don't miss them! The Cylon Base Star is a tricky construction of two identical sub-models, held together by a 1x3 technic liftarm in the center. The top and bottom dishes are a regular pentagon! The AB Raider is a new class of Raider seen in the 2nd season of the classic series from 1980. The Cylon Tanker is a commonly seen Cylon transport vessel, which is a more simple design. Check out the updated Battlestar Galactica! It is much more detailed than the old version. The new version features open hangar bays, and accurate support cross beams to hold the hangar bays. The middle support is offset and closer to the first one, like for the real model. Don't miss it! Third day in a row, third update! Today we are going to see the Colonial Shuttle, a widely used craft to shuttle between starships or to land on a planetside. Although it's a very small model, it is very detailed, and features correct cockpit angles for example, by using a nice SNOT-trick inside. Check it out! Another but lesser known Colonial fighter craft from the original 1978s series appears in the episode "The Long Patrol". It's called Scorpion, and is similar to the Viper, except that the wings are not angled and the top engine is missing. This model uses two different 1x5 pieces which prooves the importnace of such pieces. The Colonial Viper has been updated to represent a more movie-accurate model. Key piece is an 1x5 technic liftarm where you can stick in studs from both sides. Also the top engine is properly represented by using a modified 1x2 brick. Have a look! The colonial land vehicle of choice is the Landram, a solid and sturdy tracked vehicle which provides perfect cover for the colonial crew. It can be seen in the original pilot movie of the TV series of 1978. Be sure to check it out! Finally a new site has been designed for the Battlestar Galactica MINI Models made out of bricks! The new domain is bsg.deckdesigns.de. 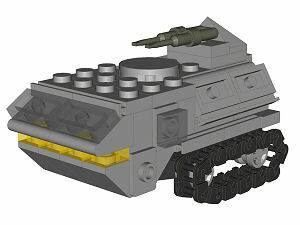 It is part of my new LEGO® site, but is a stand-alone site on itself. Welcome to the new site! Construction of the first three unique Battlestar Galactica MINI Models. They have been uploaded into a BrickShelf Gallery. A separate site for the Battlestar Galactica MINI Models had not been designed yet. This site is neither owned nor operated by LEGO® Systems, Inc. LEGO® is a trademark of the LEGO® Group. Battlestar Galactica™ is a trademark of Universal Studios. Design and content copyrighted Christopher Deck 2002-2013.